Capital IQ consensus calls for EPS of $2.02 (versus $1.90 last year) on revenue of $53.08 bln (+5.0% YoY). The current consensus is within the company's guidance range of $51.5-53.5 billion. AAPL is expected to guide for the third quarter where Capital IQ consensus stands at $45.65 billion. Last quarter, the company reported iPhone sales of 78.3 mln vs 74.8 mln last year. The company reported Q1 gross margin of 38.5% versus 40.5% last year. Looking ahead to the second quarter the Street is expecting iPhone sales of 52.5 mln versus 51.2 mln in the same quarter as last year. Based on AAPL options, the current implied volatility stands at ~ 21%, which is 71% higher than historical volatility (over the past 30 days). Based on the AAPL Weekly May05 $147 straddle, the options market is currently pricing in a move of ~4% in either direction by weekly expiration (Friday). AAPL shares have outperformed the Nasdaq so far this year with AAPL rising by 26% vs a 13% gain in the index. AAPL is trading near all-time highs. AAPL tends to have 4-6% reactions to earnings. 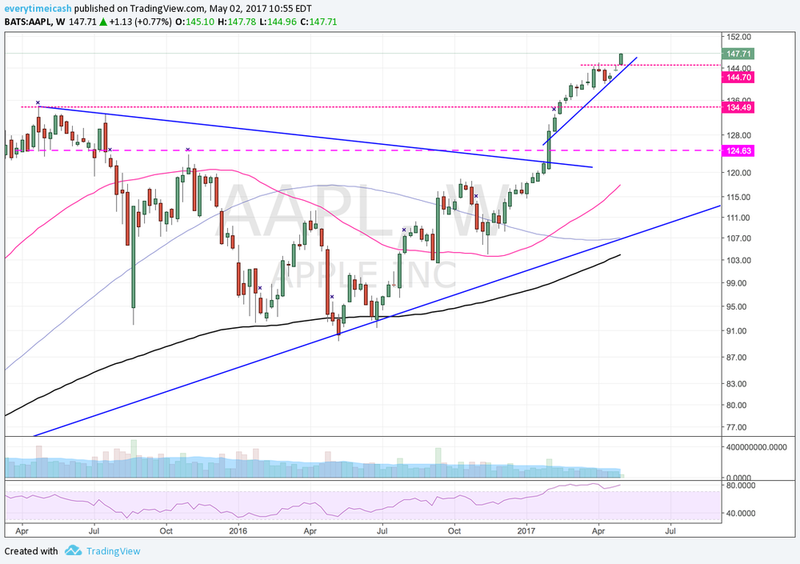 On a positive report, look for Apple to reach all time highs, while support sits near $140. Suppliers to keep on watch include: CRUS, INVN, SWKS, QRVO, QCOM, NXPI, AVGO, TXN, KYO, OLED.